- Feasibility study for the construction of the buildings included in the project of Antequera recycling plant for municipal solid waste, Málaga, Spain. - Design and analysis of several structures for a recycling plant for construction and demolition materials in Arganda del Rey, Madrid, Spain. - Structural design and analysis of the buildings included in the project of a transfer station for the San Sebastian de los Reyes municipal solid waste, Madrid, Spain. - Design and analysis of several buildings in a plant for processing, recycling, disposal and monitoring all municipal solid waste of Cáceres region, Spain. 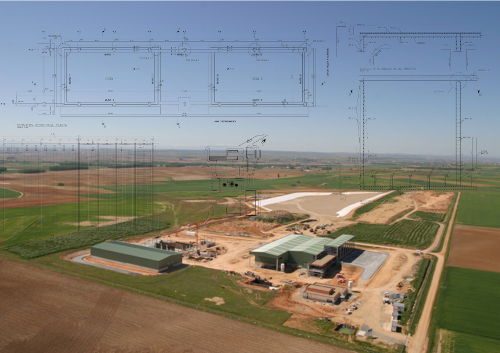 - Design and analysis of several structures for the Gomecello plant for processing, recycling, disposal and monitoring all municipal solid waste of Salamanca region, Spain. - Engineering project for the construction, management, operation and closure of El Limón landfill, 2000000 m3 capacity, for the disposal of Guaicaipuro and Carrizal municipal solid waste, Municipio Guaicaipuro, Venezuela. - Engineering project for the construction, management, operation and closure of El Algarrobo landfill, 20000 ton capacity, for the disposal of Caracas municipal solid waste, Municipio autónomo Cristóbal Rojas, Venezuela. - Engineering project for the construction, management, operation and closure of a landfill with a capacity of 1170000 m3 in Yumbo, Cali, Colombia. - Feasibility study for the management and closure of a landfill in Monforte de Lemos, Lugo, Spain. - Project for the urban design (streets, water supply networks, sewers, street lighting of San Eduardo area in Guayaquil, Guayaquil, Ecuador.